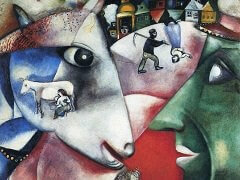 Once Chagall had settled down to work in the new studio in Saint-Paul, the old circus theme cropped up again. Ever since his childhood, when he had seen the acrobats in the streets of the little Russian provincial town, this theme never let him go. It signified the sudden invasion of the wondrous into the rhythm of everyday life, or the transformation of the humdrum into artistry, without any particular aim yet leaving behind a lingering sensation of happiness and amazement. 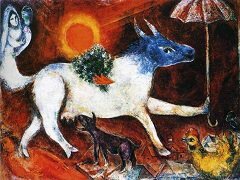 For Chagall, all this seemed to have an allegorical connection with his own art and its performance, and also with his own complicated-naive character, for he could never feel himself to be a painter alone, but also an artiste, magician, actor, and clown. Sometimes the circus theme turned up more often because of outside influences. 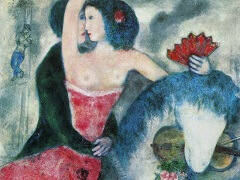 For instance in 1927, midway through the illustrations to the Fables of La Fontaine, Vollard suddenly invited him to illustrate the circus theme; night after night, Chagall sat with the famous old editor enjoying the Cirque d'Hiver. 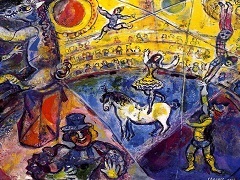 And in 1956 in Vence, he was invited to attend the shooting of a circus film in the Cirque d'Hiver; this aroused fresh interest in the theme, and the major result was the famous Big Circus of 1956, a prodigious canvas measuring 59 by 122 inches. 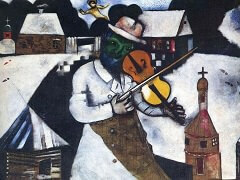 But apart from such highlights, the theme runs throughout his work. It is the most extraordinary of all the circus pictures. The basic color tone is determined by black and white. The effect is impressively dramatic and deeply serious. 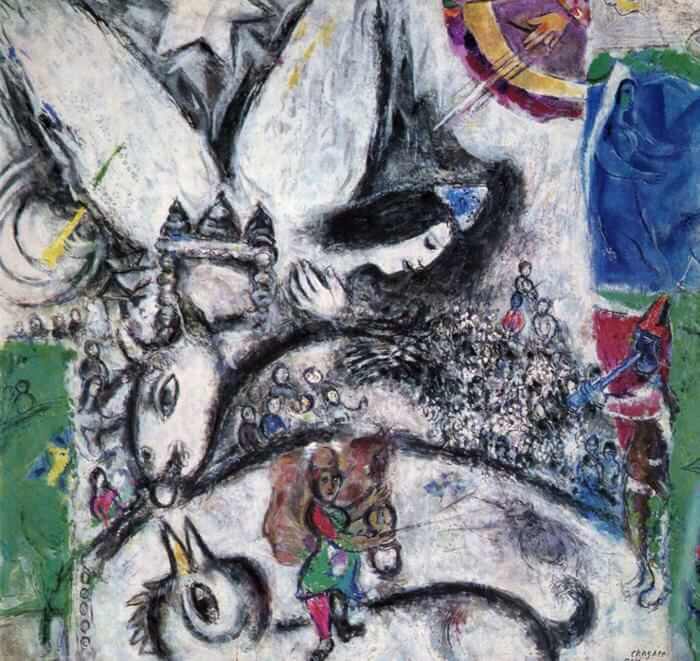 The rhythmic pattern of the arcs and the surrounding composition has a strangely solemn - one might almost say Byzantine - quality, such as we find in Chagall's sacred windows. Bordering the blackand-white zone on either side are abstractly located color planes of cool green, and on the upper right-hand side the strip of terrestrial green is set off by a panel of nocturnal blue. Like curtains, these color zones screen off the spiritual realm of the vision. 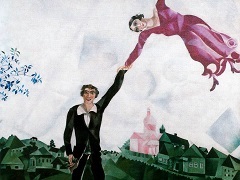 But the suggestions of these varied colors, occurring in abstractly placed panels without regard to objective coloring, in the coloristic method used by Chagall at this period, have the effect of transforming the black and white into color - into glistening light and darkness. In terms of color, the drama is already staged.